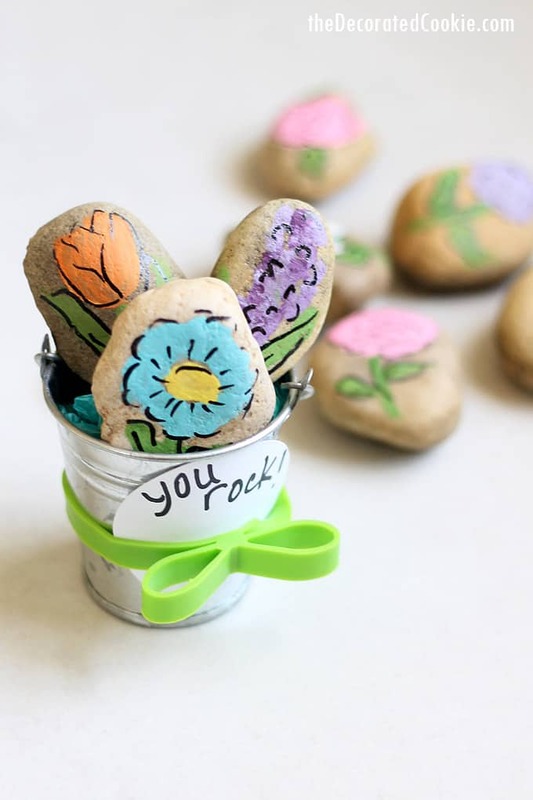 Flower painted rocks are a cute and easy handmade gift idea for birthdays, Teacher Appreciation, Mother’s Day, Father’s Day, or just for fun. 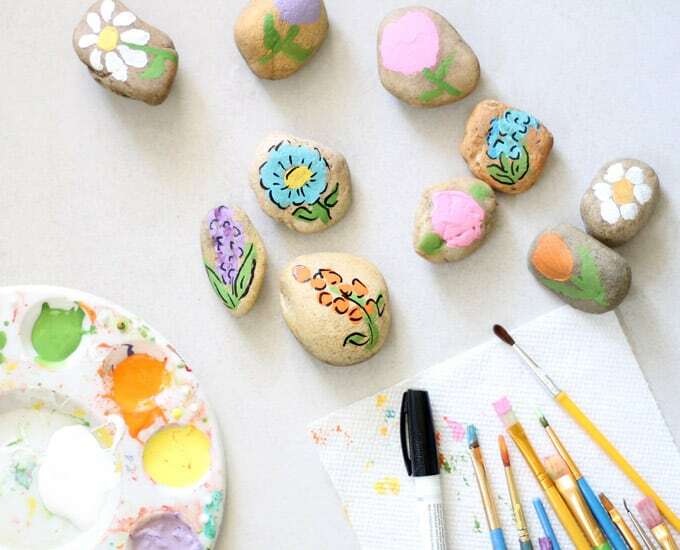 As far as kids crafts AND adult crafts go, you can’t go wrong with painted rocks. 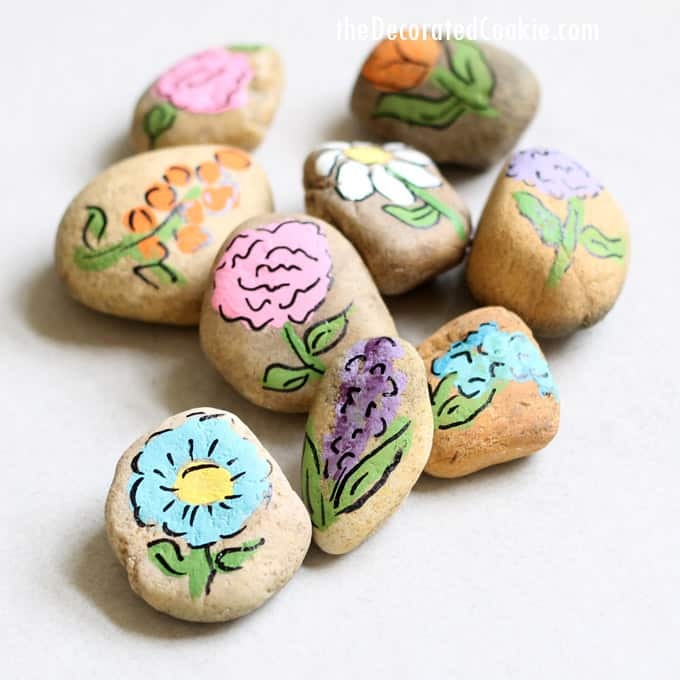 Here, I whipped up some flower painted rocks for a cute Mother’s Day gift idea (or birthday gift idea, or Teacher Appreciation gift really any handmade gift idea). Or, paint a bunch of flowers and place them around your garden and yard. 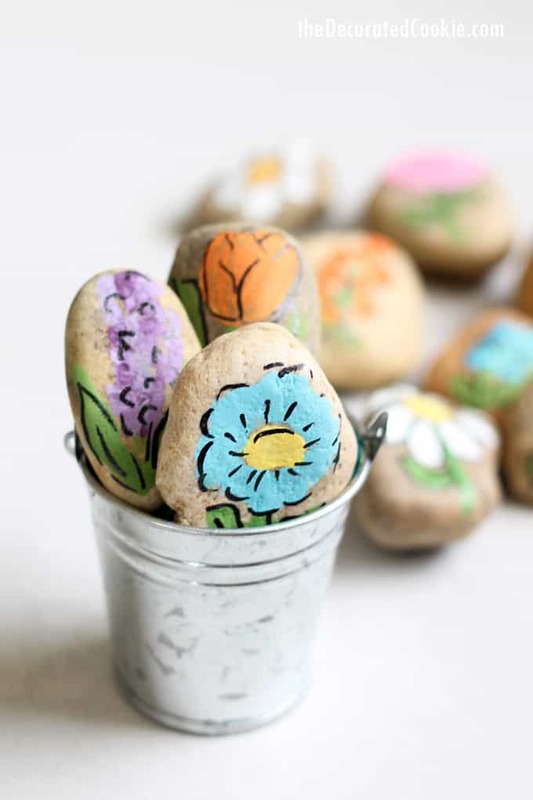 Painted rocks are super popular right now, and with good reason. The supplies are budget-friendly. You only need to purchase craft paint and paint brushes. 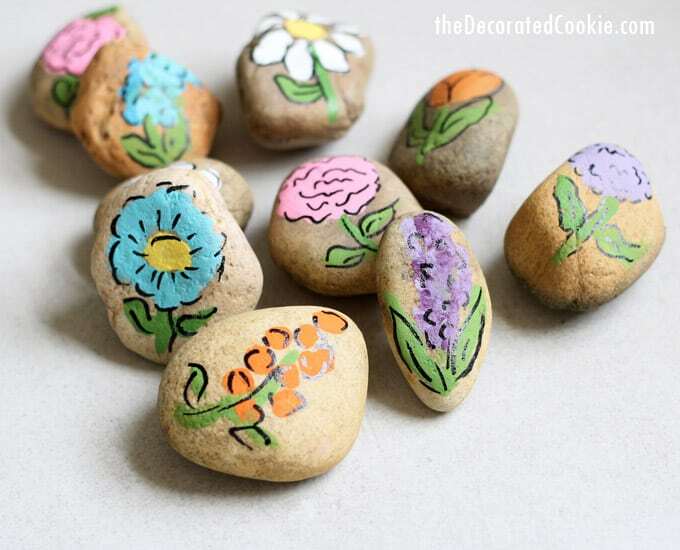 You can also use oil-based paint markers to draw on rocks. Take a walk outside to find the rocks. For my first rock painting adventure, I made these melting snowmen rocks. 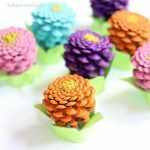 If you like this idea, you might also like this roundup of no-sew crafts or this roundup of handmade Mother’s Day gift ideas. Wash and dry the rocks. Paint your designs. You may also use the paint markers. You can spray sealant on the rocks, but I prefer to not add the chemicals and to leave the rocks as-is. If left outside, the paint may not last forever, but it will naturally wear away. 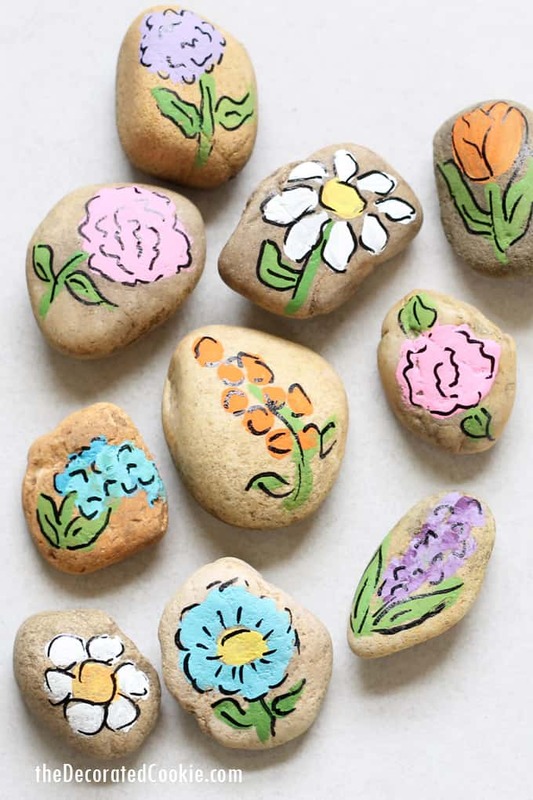 Here, I painted flowers on my rocks. First, I painted the flowers with the craft paint and brushes. You may need to use two to three coats of paint for an opaque look. Let the paint dry between each coat. I easily outlined the designs with a black Sharpie oil-based paint marker. You must let the paint fully dry before adding the details with the paint marker. 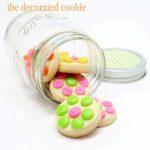 For a handmade gift idea, choose a little container or flower pot. 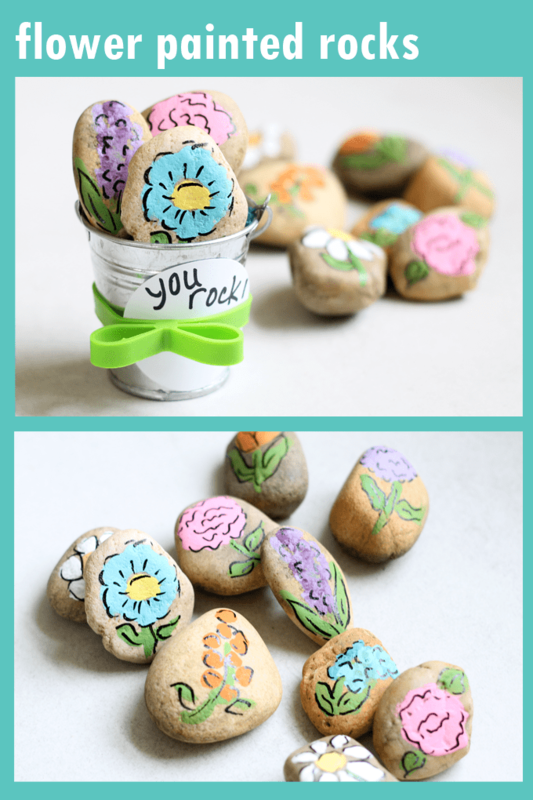 Stuff the pot with tissue paper and arrange your rocks. Attach a tag that says “YOU ROCK!” I found the little bow elastics at The Container Store. You can use this handmade gift idea for teacher appreciation, Mother’s Day, birthdays, Father’s Day, or any day.